This section describes some of the sources of the noise you may hear near your airport. Also mentioned are ways the airport attempts to reduce the noise impact to your community. There are many different sources in and around an airport that produce noise. The most commonly known source is an aircraft, and the first thing you may think of when recalling aircraft noise is the engine. Technology has reached a point where there are few things that can be done to decrease the noise of the engine. Most of the noise generated from the aircraft engines typically occur from the high velocity exhaust gases and the air flow in the fan system. Another aspect of an aircraft that generates noise is the airframe. Many people are not aware of this noise, but it may become a concern as engine efficiency and noise reduction have decreased as much as is technologically possible. How Do Propeller Engines Operate? Like automobiles, air is mixed with fuel in a carburetor, which in turn is sprayed into a cylinder through a spark plug. Here, it is burned in order to produce the pressure needed to return the piston to the bottom of the cylinder where the combustion cycle can continue on to the exhaust stroke. In the case of a propeller aircraft engine, a propeller is attached to the end of the crank shaft to effectively pull it through the air. Large propeller aircraft are powered by turbo shaft engines which are very similar to jet engines. The source of noise in a propeller aircraft is the propeller itself as well as the engine exhaust. How Do Jet Engines Operate? Jet engines have a mysterious aspect to them because there are very few moving parts. In the front of a jet engine there is a set of fan blades which pull air into the engine. After this initial set of blades, there are several stages of rotating (rotors) and stationary (stator) blades that make up the compressor section of the engine. In the compressor, air is drawn further into the engine. Each consecutive stage of blades gets smaller and smaller in order to compress the air. At this point, the air has been compressed by up to 40 times its original density and the temperature has dramatically increased. The reason for compressing the air is because compressed air is very flammable. This is why all compressed air canisters state on the can that you should not try to puncture or incinerate the can. Once the air has been compressed, it enters the combustion chamber. There are a number of different types of chambers but the end effect is the same. The compressed air is mixed with some jet fuel and is burned. The rapidly expanding air needs a place to expand to and can not go through the front of the engine due to the force of the incoming air. It expands through the rear of the engine and produces thrust. Just before the exhaust gases exit the engine, they pass through another set of turbines, the exhaust turbines. The gases spin the exhaust turbines which are connected to the fan and the compressor blades in the front of the engine through a shaft. This, in turn, draws new air into the front of the engine and starts the cycle over again. Each jet engine component contributes to the total noise generated by the engine. 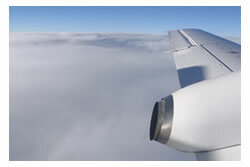 In general, during takeoff, the exhaust (jet) and the fan are the dominant noise contributors. Whereas, the fan and airframe are the dominant noise contributors during landing. Many people may not be aware of the fact that parts of the airframe--wings, flaps, and landing gear--also produce a lot of noise. During landing, most of the noise heard from the ground comes from these components. This noise is characterized by sharp, low frequency peaks. Airframe noise is particularly noticeable on approach, when propulsion and throttle-related noise sources are relatively low. The various airframe noise sources that are audible above propulsion noise sources are characterized by low peak frequencies, typically less than 1 kHz and often much lower. What Noise Do I Hear on the Ground? If you live near an airport, some noises you may hear are actually generated on the ground at the airport -- both from aircraft and other sources. Aircraft need to be maintained and inspected. Fully loaded aircraft, ready for take-off, will perform an engine "run-up". The run-up is done to check that the engine is working properly and that certain instrumentation is reading correctly. In some instances, the engines need to run for an extended period of time while inspections are performed. This is called a full power run-up. The focus of this procedure is specific to the type of inspection. 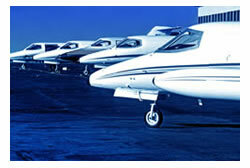 Generally, the aircraft is not loaded with passengers and its goal is not to take off from the airport. Another engine noise you may hear could be an auxiliary power unit (APU). The APU is a relatively small self-contained turbo shaft engine used in aircraft to start the main engines, usually with compressed air, and to provide electrical power and air conditioning while the aircraft is on the ground. In many aircraft, the APU can also provide electrical power in the air. The APU is not any of the engines you may see mounted on the wings or in the tail. In most cases, he APU is located in the fuselage, behind the passenger cabin. What Noise Reduction Attempts Do Airports Make? Airport administrations have several instruments they can use to minimize the noise exposure of residents around an airport. Some require large investments in new facilities and others merely require the implementation of a policy that can be enforced at the airport. On the ground, the airport may establish restrictive policies to minimize community noise exposure from the full power run-up. The airport may require that run-ups only take place during certain hours to maintain quieter night time hours. 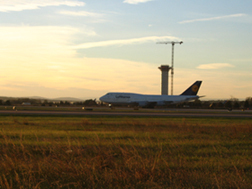 In some cases, the full power run-up may be performed in a part of the airport that will minimally impact residents no matter what hour of the day. At an airport that is financially capable, another noise reduction tool is a Ground Run-Up Enclosure (GRE). A GRE is a roofless three-sided building, sized to handle the aircraft being inspected. The goal of a GRE is to give airlines the ability to perform the full power run-up without causing the great deal of associated noise. The walls of the GRE are both angled to direct the noise waves into the sky and made of a highly effective noise absorbent material. Ground Run-Up Enclosures aim to reduce noise by 20dB or 75%.